Meaning is what we want. Understanding is what we need. Choices are what we make. Relationships are what we have. How can we create greater shared meaning and sense of purpose, make more effective choices, and enhance our interpersonal and interorganizational relationships? How can we work together more effectively, involve the full diversity of players and still get things done? Collaboration is often viewed as one-time or project-oriented activity. An increasing challenge is to help organization incorporate collaborative values and practices in their everyday ways of working. In Creating a Culture of Collaboration, an international group of practitioners and researchers–from Australia, Belgium, Canada, Chile, New Zealand, Northern Ireland, United Kingdom, and United States–provide proven approaches to creating a culture of collaboration within and among groups, organizations, communities, and societies. 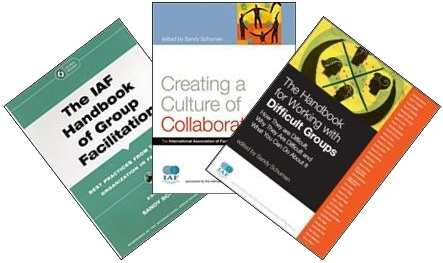 A practical resource, Creating a Culture of Collaboration integrates the underlying bases of collaboration with field-tested approaches and provides numerous examples of collaboration in action that illustrate the application of theory in practice. In addition, the book is filled with useful figures, exhibits, and tables that clearly illustrate that expand on the ideas presented. Creating a Culture of Collaboration is written for group facilitators, organization development practitioners, public participation specialists, and any advocate of collaborative processes, people who are concerned with conflict, consensus, and change. ~ David A. Wayne, chair, International Association of Facilitators; chief operating officer, Tapestries International Communications, Inc.
~ Ingrid Bens, author, Facilitating With Ease!